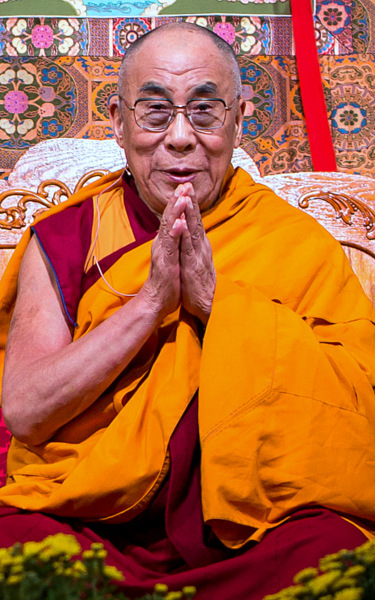 His Holiness the Dalai Lama at Kurukulla Center, October 2012. Photo by Kadri Kurgun. “According to Buddhist psychology, most of our troubles are due to our passionate desire for and attachment to things that we misapprehend as enduring entities. The pursuit of the objects of our desire and attachment involves the use of aggression and competitiveness as supposedly efficacious instruments. These mental processes easily translate into actions, breeding belligerence as an obvious effect. Such processes have been going on in the human mind since time immemorial, but their execution has become more effective under modern conditions. What can we do to control and regulate these ‘poisons’— delusion, greed, and aggression? For it is these poisons that are behind almost every trouble in the world. “As one brought up in the Mahayana Buddhist tradition, I feel that love and compassion are the moral fabric of world peace. Let me first define what I mean by compassion. When you have pity or compassion for a very poor person, you are showing sympathy because he or she is poor; your compassion is based on altruistic considerations. On the other hand, love towards your wife, your husband, your children, or a close friend is usually based on attachment. When your attachment changes, your kindness also changes; it may disappear. This is not true love. Real love is not based on attachment, but on altruism. In this case your compassion will remain as a humane response to suffering as long as beings continue to suffer. You can read this teaching on world peace by His Holiness the Dalai Lama in its entirety on Lama Yeshe Wisdom Archive’s website.